Current expanding universe cosmology models propose that the non-uniform distribution of matter plus a slightly elevated temperature above absolute zero degrees in deep space is added proof of a Big Bang moment of creation in the far past. They claim that matter could not have become clumped into small regions and strings of galaxies would not have been so closely associated if not for the hypothetical irregularities in a Big Bang explosion scenario. Such connections of what I would view as disconnected and independent observations is partly the reason for the current cosmology models being so far fetched and unprovable. One would hope that some realworld physics and physical chemistry is not too late in coming to allow a more direct and uncomplicated reanalysis of the COBE and matter distribution arguments at this point. Too many cosmologists have "hopped on the BB bandwagon" without going back to the basic physics that is taught in every university. It does NOT take a Big Bang's hypothetical release of electromagnetic energy to explain why all non-luminescent matter in the universe heated up. They philosophize about the newly synthesized matter in the universe having all been extremely hot and then cooling down during the following 14 billion years. The COBE residual temperature is written off as being the "embers" or afterglow and all that remains of the original BB heat release. I have felt this explanation did not follow Occam's Razor from the beginning of its reported measurement. I offer a more plausible and direct explanation for the non-zero baseline temperature seen throughout space by the Cosmic Background Explorer orbiting observatory (COBE). The most logical and simplest explanation is that this Cosmic Microwave Background (CMB) represents the longest resultant wavelengths of the electromagnetic spectrum that we can measure and that this signal has a non-zero strength which is caused by the absorption, molecular vibrational energy partitioning and re-emission of ordinary dust and matter in the Intergalactic Medium (IGM) after it is originally illuminated by all incident light of higher energy values. The space between all luminous stellar bodies is filled with electromagnetic waves of all wavelengths. Whenever solid matter absorbs electromagnetic energy, it is degraded through a partitioning process into lower thermodynamic energy steps. Thus when such energy eventually reradiates away from that body, the exiting EM waves will always have longer and longer wavelengths. As an example, think of the infrared heating caused by the Sun's irradiance of the earth's surface. Now consider what happens to that surface temperature if the heat source is moved farther and farther away. The corresponding temperature goes down towards absolute zero. But it can never quite get to absolute zero since Quantum Mechanics and Heisenberg's Uncertainty Principle prevent anything from going below the "Zero Point" energy for a particle. So the combination of a Zero Point energy plus a tiny amount of heating from all the heat sources in the universe eventually casting their photons onto a particular particle's surface would result in the 2.7 deg K CMB background. That explains the slight above zero temperature quite differently than assuming a hot BB origin. It also means that this is an equilibrium and constant temperature rather than an ever decreasing one. Now let's look at the question of the clumpiness of matter. In this physicochemical model of an infinite, never-ending universe without a beginning, there is an infinite amount of matter present along with an infinite amount of non-material energy forms such as fields and all of this resides in our space-time continuum that has infinite spatial and temporal limits. How can this be? According to Cantorian set theory mathematics of infinities, there can be different sized "infinities" that can co-exist and can reside one inside another. To illustrate this, one takes a 1 foot long thread and cuts out the middle third and burns it. The remaining two segments are each sectioned in a similar fashion with the removal and destruction of their middle thirds. This process is repeated over and over and infinite number of times with every smaller pieces of thread. Ultimately you would wind up with an infinite number of infinitely small pieces of thread that fit well inside our vast universe. In fact, they would still fit inside your pocket. And you would have also burned up and infinite number of pieces of excised thread. Infinities existing inside even larger infinities. That was Cantor's dust explanation of different sized infinities. But even more important, from Chaos Theory we know that most real world processes and dynamic systems follow non-linear paths rather than simplistic and idealized linear physics. Once you incorporate the concepts of chaos within a physicochemical universal model, the principles of self-sameness and fractional dimensionality become inescapable. With self-sameness it is much easier to look for the same patterns and structures repeating themselves at different scales. 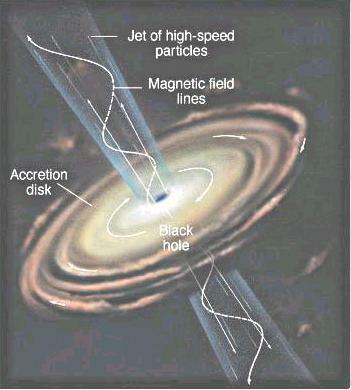 Matter randomly moving through space is first attracted through gravitational forces to other matter. As different bodies move closer to each other, the center of mass increases in value drawing more matter towards itself. Incoming matter following known laws of orbital mechanics will always settle into orbits around each other if not on collision courses and moving at sub-escape velocities. Magnetic fields couple between such moving bodies and begin to orient and bias orbits towards the lowest energy value, the ground state. As this continues to occur, a planar distribution ensues and ultimately when this process is matured, a spiral galaxy is formed. What happens next is part of the other story in this reanalysis of cosmology. But as a preview, the center of this galaxy contains a chaos theory strange attractor, a supermassive black hole. This SMBH continues to grow as more matter collides with it and increases its mass, gravitational field, rotational speed and the internal pressures that result. After it reaches a critical point in its development, based upon the amount of mass and its rotation rate, this collapsed matter object must generate a mechanism to rid itself of angular momentum. This mechanism of bleeding off excess angular momentum is what forms the characteristic jets eminating from the axial poles of black holes and especially supermassive black holes. The jets are formed by huge amounts of quarks being ejected along the polar axes in twisted helical paths and as they move away from the pole they came from, they encounter other quarks and combine with them. In this zone within each jet, the first most common particles that result are protons and electrons. 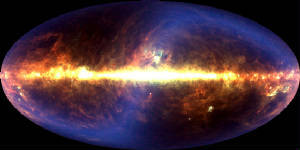 This is where all hydrogen in the universe forms and which eventually collects to form protostars. This cycling of infalling matter being squeezed to unimaginable pressures to cause its complete collapse to its consituent quarks followed by ejection and recombination to form the first element of the periodic table closes the Cosmological Cycle that is proposed here. In other words, the Big Bang actually occurs continuously and in an infinite number of places in the universe. It is delocalized rather than localized as in the convention models. It is occuring whereever a black hole of any size has formed and is operating. As mentioned earlier, the chaotic self-sameness at any scale should be looked for. The same planar orbiting of smaller bodies around a more massive central body is seen in virtually all stellar systems. Gravity and magnetic forces operate in the same way at this smaller scale. But in most stellar systems, the star usually does not continue to grow so quickly into a supergiant that can collapse into a black hole. Instead it burns its hydrogen, helium, and a few higher elements through thermonuclear processes until it final exhausts those fuels. Then the star may ultimately cool down, begin to collapse to a higher density state and undergo supernova instability. The resultant SN explosion is more energetic and can fuse lower elements into heavier elements. Thus the naturally occuring 92 elements of the periodic table are finally formed between these two basic physical processes. The first process, black hole ultracompression and later supernova explosive force. Ultimately, these higher elements find their way into ordinary matter, planets, living organisms, and finally ultimately will be recycled back through another black hole or supermassive black hole in the distant future. This recycling process can go on indefinitely and forever throughout this non-expanding universe. Looking again at an even smaller scale, the structure of atoms again follows this self-same pattern of chaos. Electrons occupy different orbitals around a central and more massive body but the forces holding everything together become less dependent on gravitional attraction and more attuned to electric, magnetic, weak and strong nuclear forces. Though not planar in the same way as the higher versions of this pattern, there is an atomic plane that all the orbitals are tied to in their individual orientations. It would be quite surprising if this self-same pattern was not repeated at the intranuclear and subnuclear particle levels as well as even at smaller scales than quarks! Chaos Theory was developed to tie together many mathematical relationships that find their validity in actual naturally occurring phenomena. They are simply simulacrums of the real world. The equations are not some rules that a cosmic being or God dictated. They are simply Man's attempt to measure and quantitatively describe all of the non-linear physical events around us. But have they made us aware of such unexpectedly rich and hidden relationships!